Fuel is a major operating expense for every fleet, no matter how large or small. GreenRoad helps you reduce your fuel bills by up to 30% by alerting drivers during risky, fuel-wasting driving behaviours like sharp braking, rapid acceleration, and high-speed driving. Fleet managers can reduce fuel costs by setting fuel consumption budgets, idling rate goals, and target fuel efficiency rates. Tailor goals by region or team and provide managers and drivers with actionable steps for success. For many fleets vehicle idling burns through profits at a rapid rate. 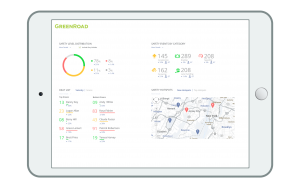 GreenRoad helps you identify when and where your fleet wastes fuel by idling, so you can resolve the underlying issues. Integrate fuel card purchase data with GreenRoad to quickly uncover and address fuel purchase irregularities. Flag purchases that exceed vehicle fuel tank capacity or do not match fuel tank levels or vehicle location. GreenRoad makes it easy to submit International Fuel Tax Agreement (IFTA) forms. Create summarised or detailed mileage reports for each driver and vehicle by state.